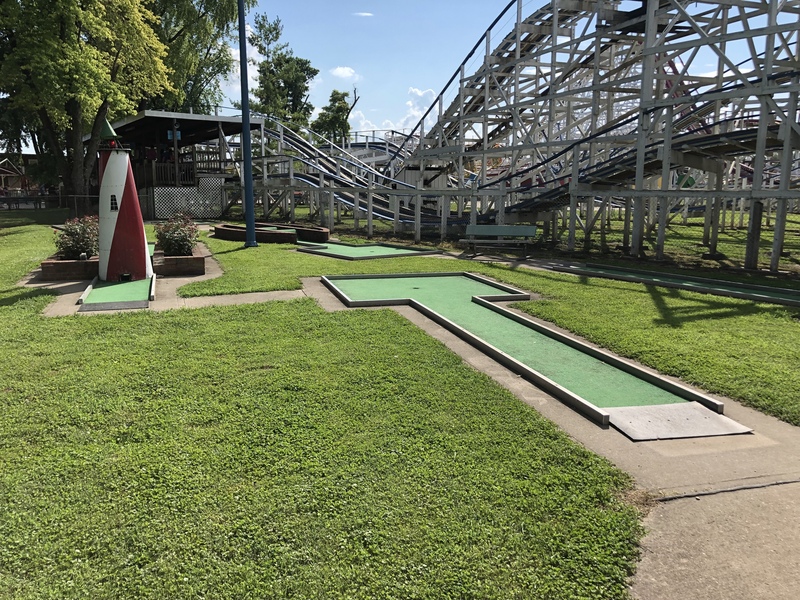 Stricker’s Grove originally opened by Henry Stricker on a 55 acre (22 ha) plot of land next to a Drive-in theater on Compton Rd. in Mt. Heathy in Ohio in 1924. 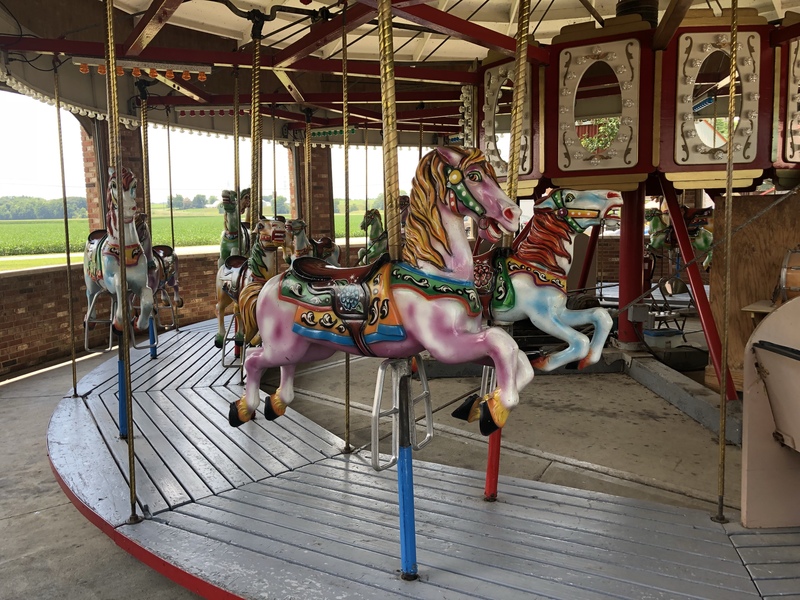 The Stricker family lived on the property and originally used the property for coworkers to picnic and enjoy the countryside on weekends. A dance hall was later added and designed so that it could be converted into a chicken coop should the park fail. Later on rides like a horse and pony track. Rides like the Boat Ride and Rockets arrived in 1954. Sadly, Henry died in 1960 and passed the park on to his sons, Harold, Elmer, and Ralph. 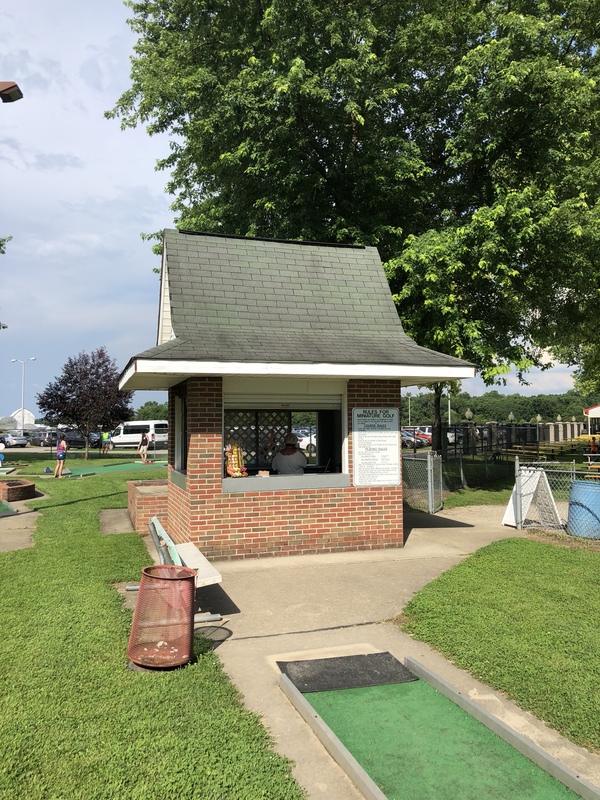 The park was eventually relocated to its current location in Ross, OH in 1972 when Ralph became the sole owner. Unfortunately Ralph passed in 2007 leaving his daughter Debbie and three longtime employees to operate the park. 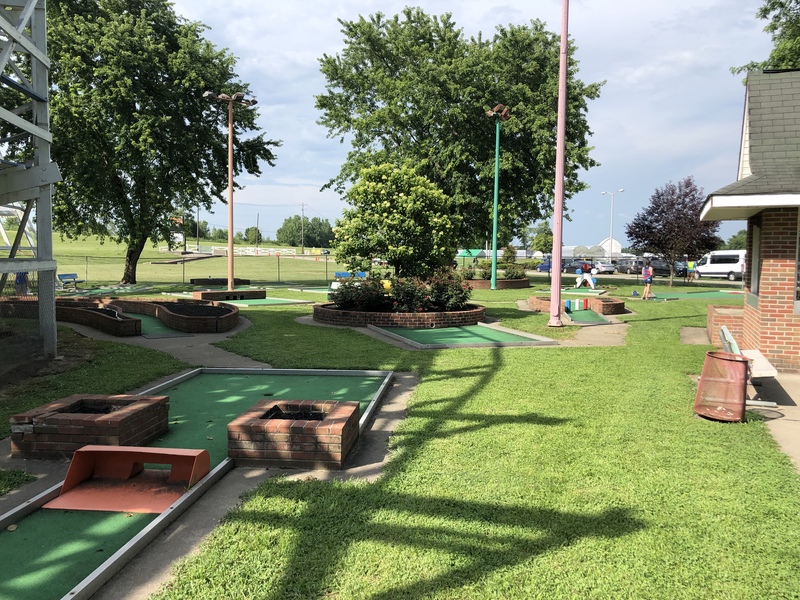 This park isn’t open to the public like most parks are as they mainly rent to company’s, churches, and large groups but they are open to the public on certain days each year so check their website at http://strickersgrove.com/ to check the dates. I happen to visit on Independence Day which is July 4th. 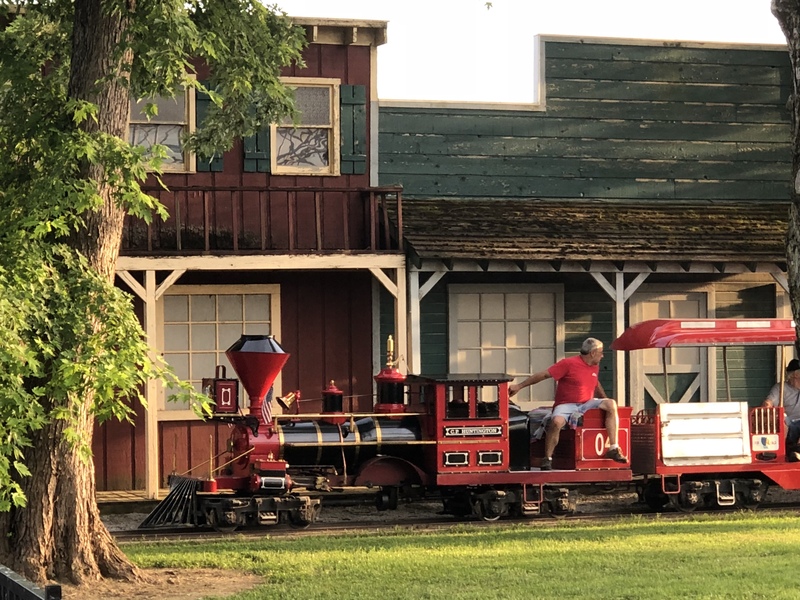 The park itself is 25 acres (10 ha) and has a total of 17 attractions and two wooden roller coasters, an indoor air-conditioned dinning hall, barn, rodeo arena/livestock area, large outdoor covered and uncovered picnic groves, and a midway with concessions and games of redemption. 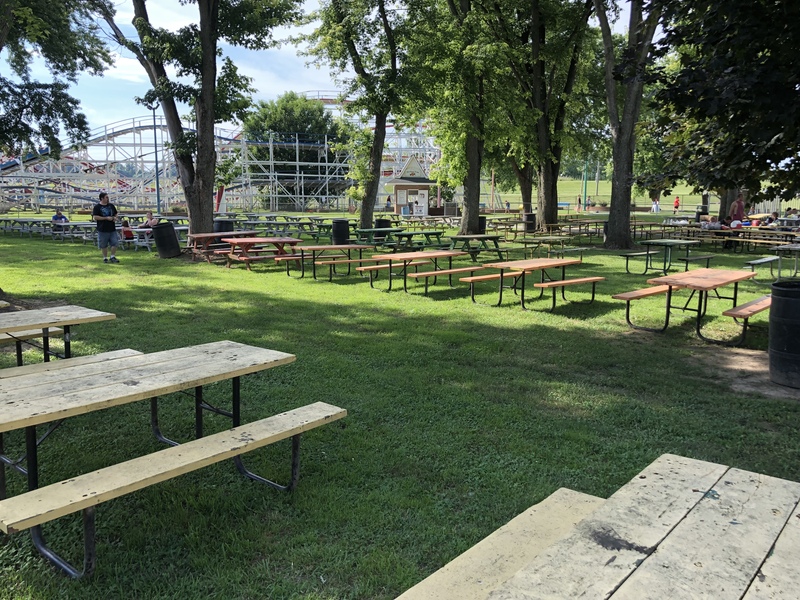 The photo below shows the indoor dinning hall on the left, and the concessions, mainly burgers and hotdogs, in the middle, with the outdoor picnic groves on the right. 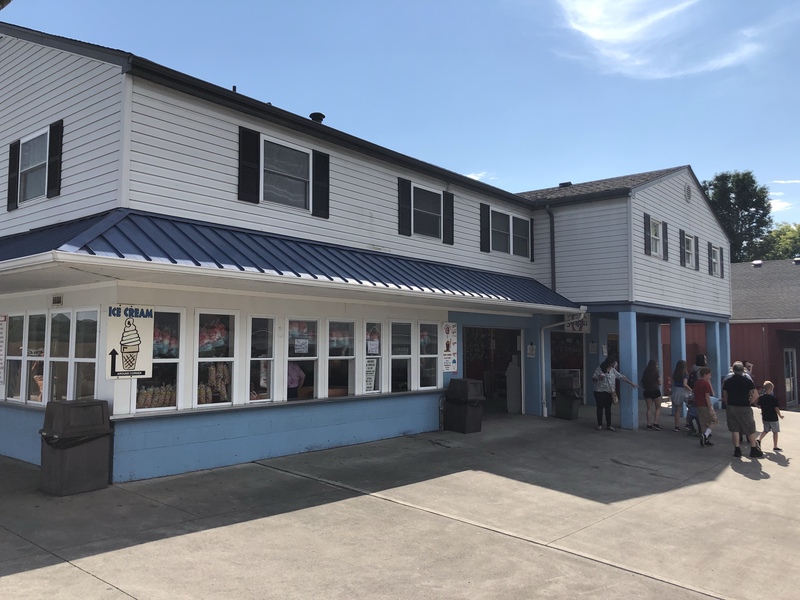 Here, you’ll see the drink and ice cream stand in the blue building and the redemption games in the red building where there also is a shooting gallery amongst the games of chance. 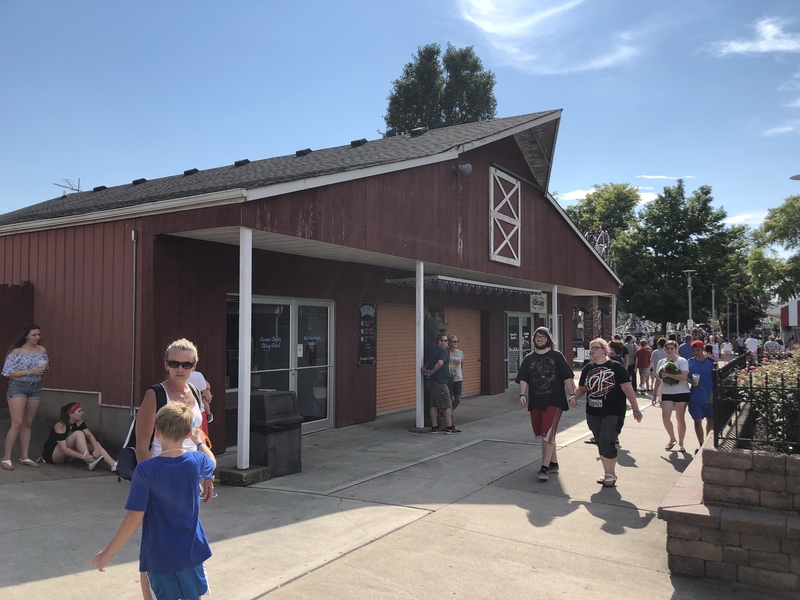 Across the midway and next to the covered picnic grove, there is the building where you can buy individual ride tickets or a ride all day wristband. On the other side of the dinning hall is the barn and rodeo/livestock area. 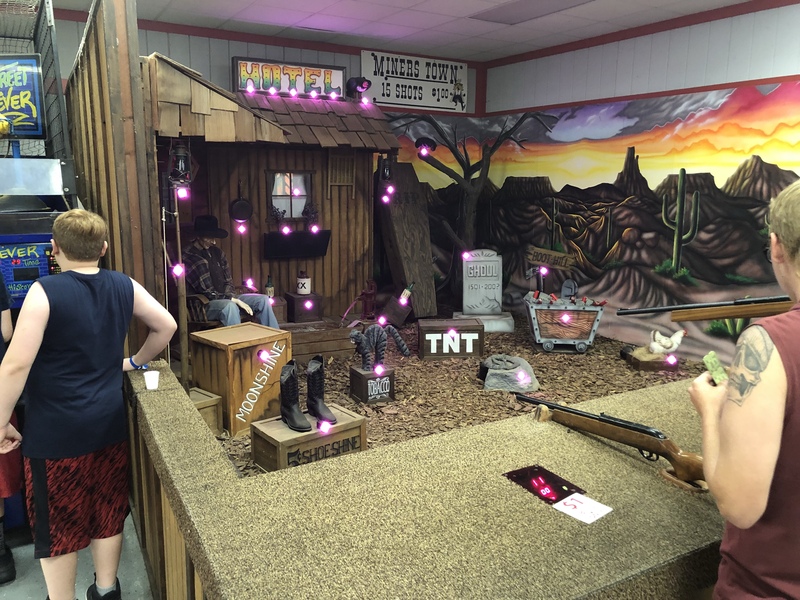 Now we get to the attractions. 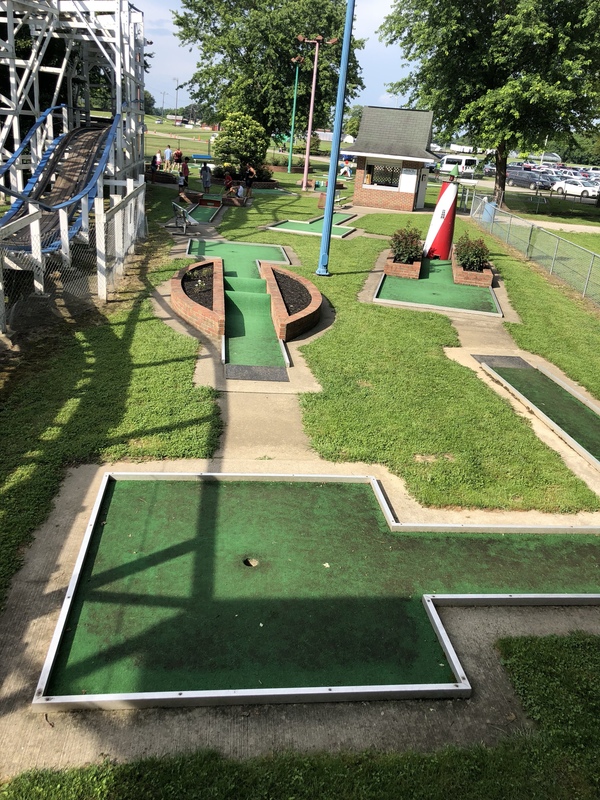 Behind the picnic groves is a goofy golf/put-put course. 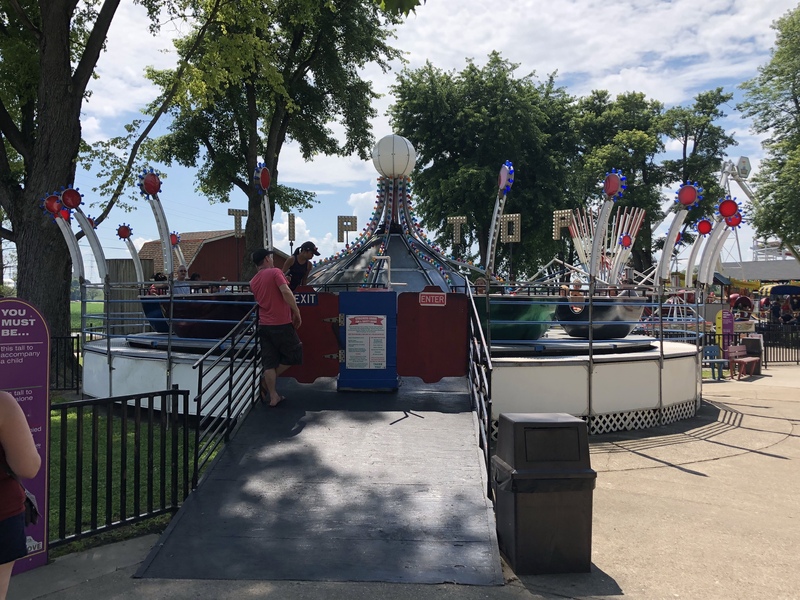 Now come the rides on the midway, starting with the kiddie rides on the right side. 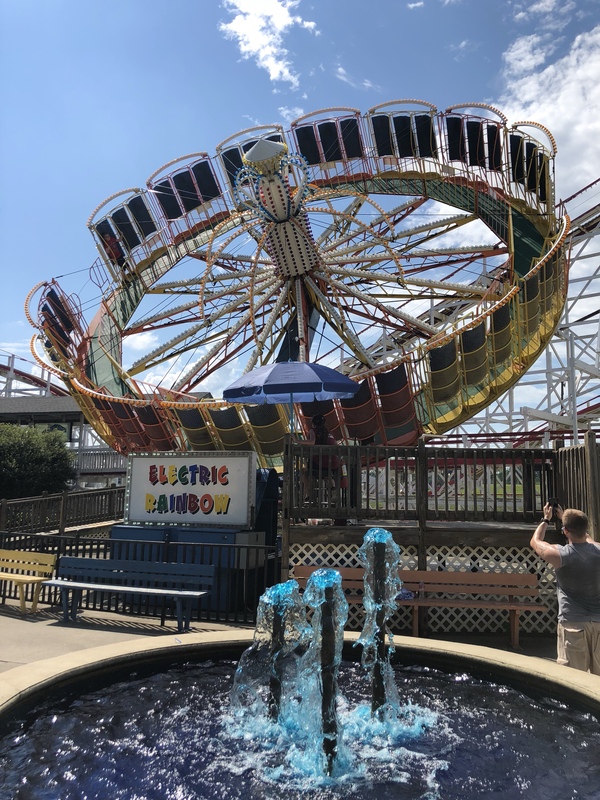 There are three rides under a big roof which include the Rockets and Boat Ride that came from the original location, the other is a cars ride that you’ll see traveling the carnival circuit. Next up is a Kiddie Whip. 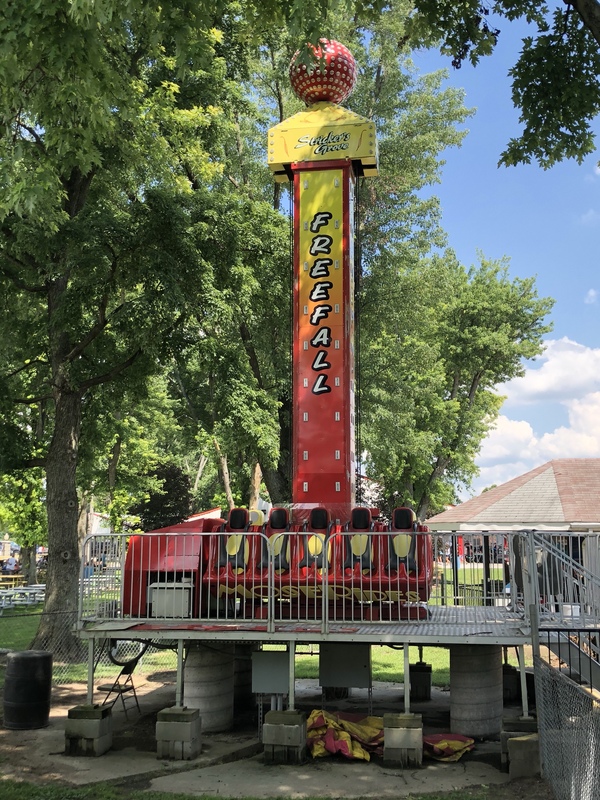 Then there is a kiddie drop tower from Mosier Rides. 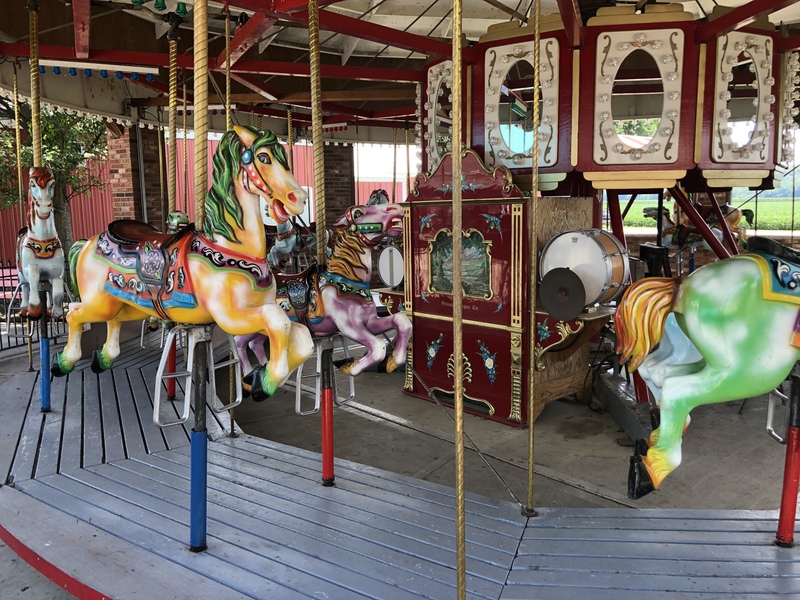 On the left side is the Merry-go-Round. 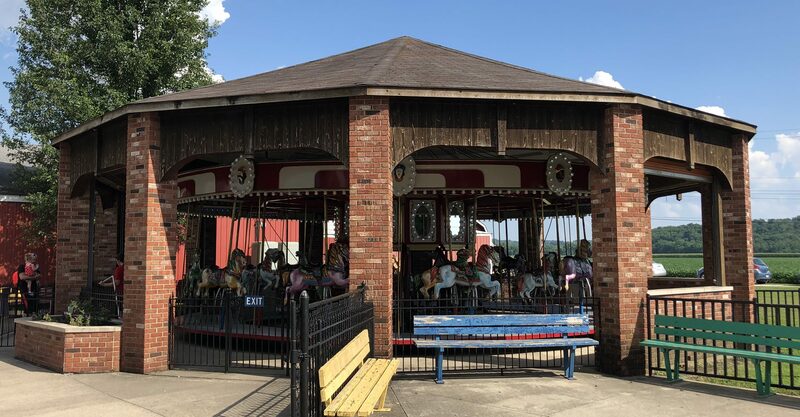 This attraction is a 1950’s era traveling carousel model from the Allen Herschel Company. It has three rows 30 with metal jumping horses and two chariots. There is a fully functional Stinson model 31 band organ as well. 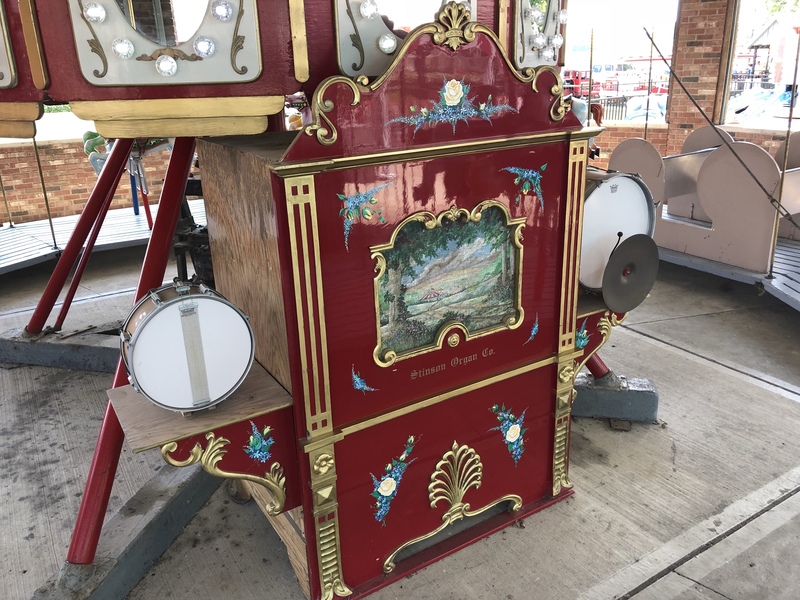 It is so rare to have an operating band organ with a carousel. 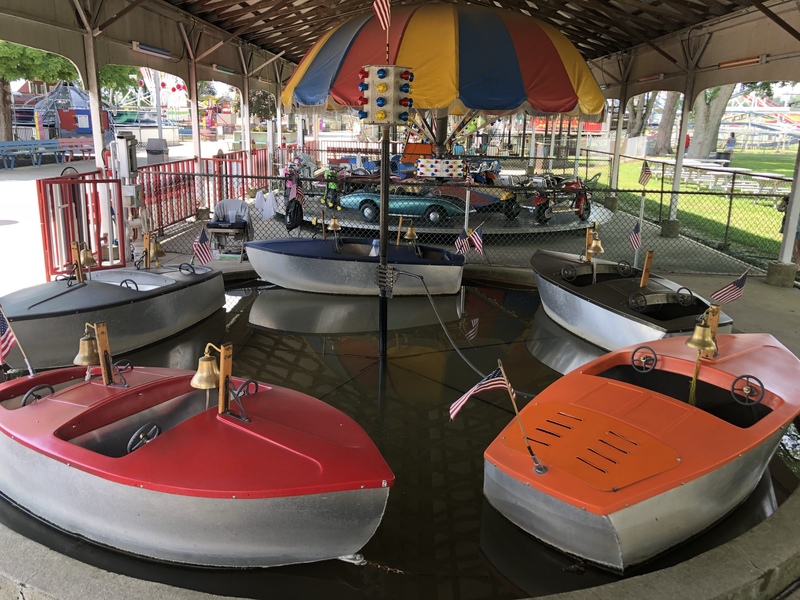 Thankfully Stricker’s Grove takes very good care of their organ and other attractions. 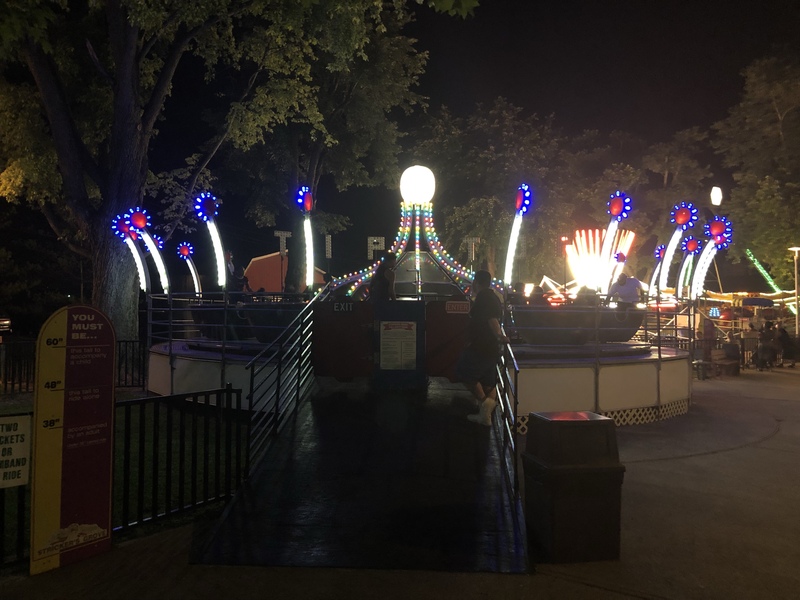 Here is my off ride video of the Merry-go-Round. 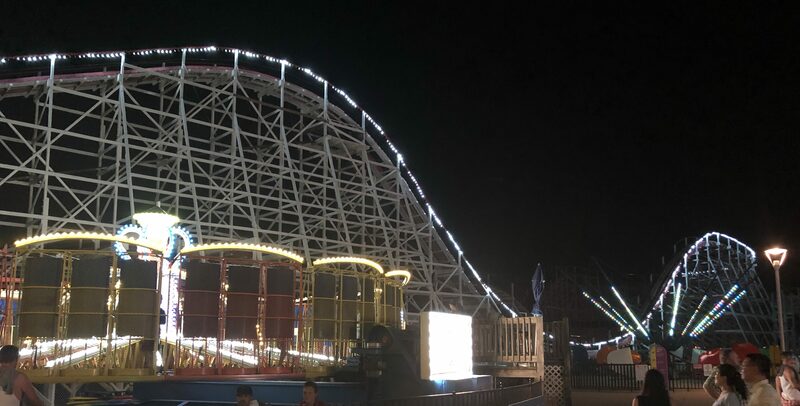 The next photo shows the Elephants, Train, and Ferris Wheel. 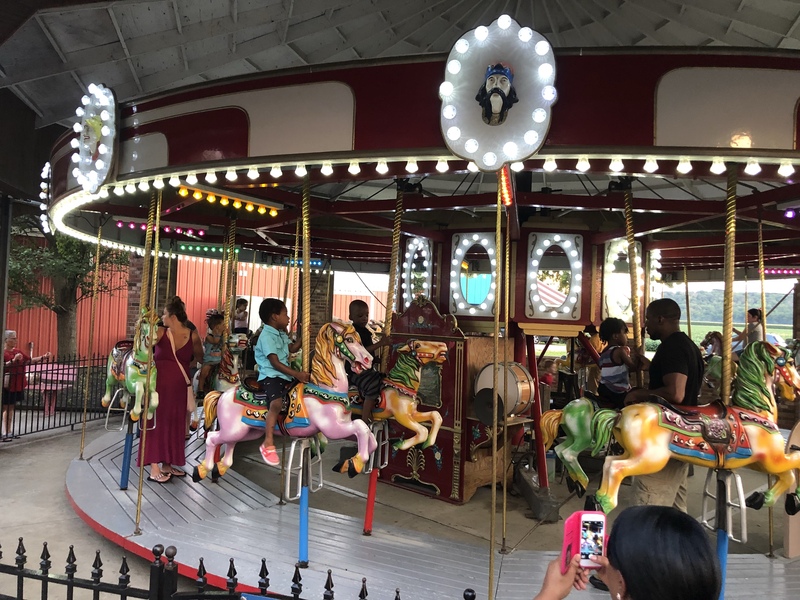 The Elephants ride is the last attraction where kids can only ride. The Train came from the C.P. Huntington Company and has been operating here since 1981. Here’s my on ride video of the Train ride. 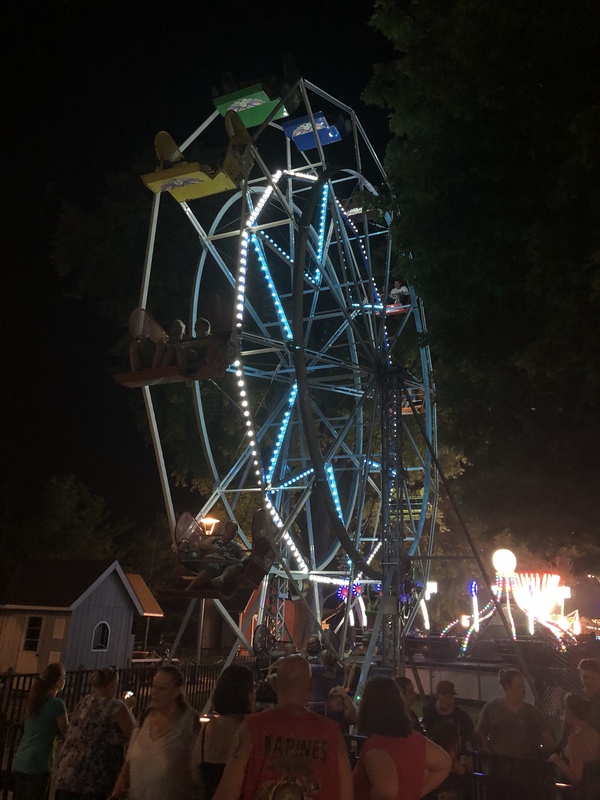 Next up is the Ferris Wheel which is a FY-5 model from the Eli Bridge Co. 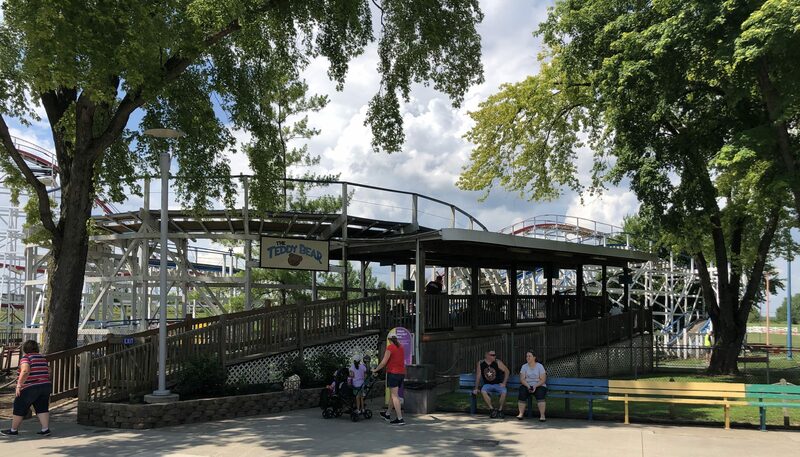 It is a nice relaxing ride that gives riders a decent view of the park. Here’s my on ride video of the Ferris Wheel. Next up is the Tip-Top from the Frank Hrubetz & Co. This ride seems to be a rare one as it is the only one I’ve seen. 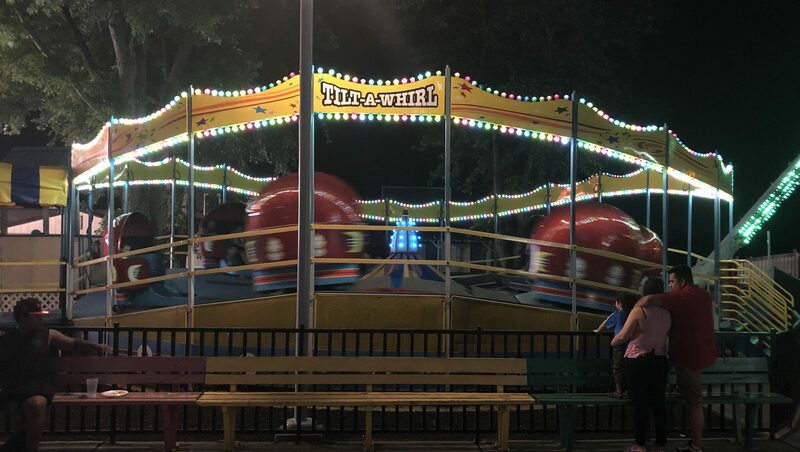 It has ten tubs that each spin on their own by the riders themselves. 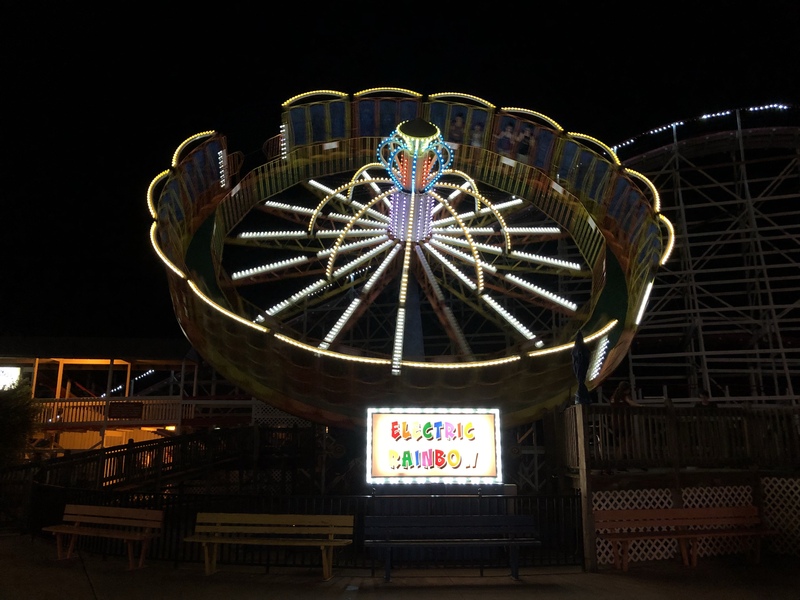 Those tubs are mounted around a central axis point which spins as well and jumps up at different times during the ride cycle. It really is fun and best operated with two people of about the same weight so you can really get the tub spinning. 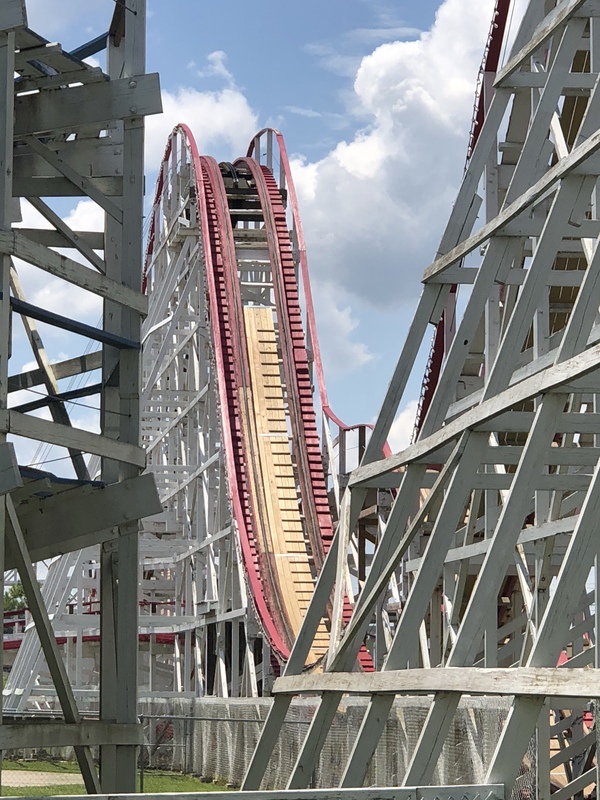 Here is my off ride video of the Tip-Top. Next up is the classic Scrambler from the Eli Bridge Co. This attraction has 12 gondolas arranged with four gondolas per arm with three arms. 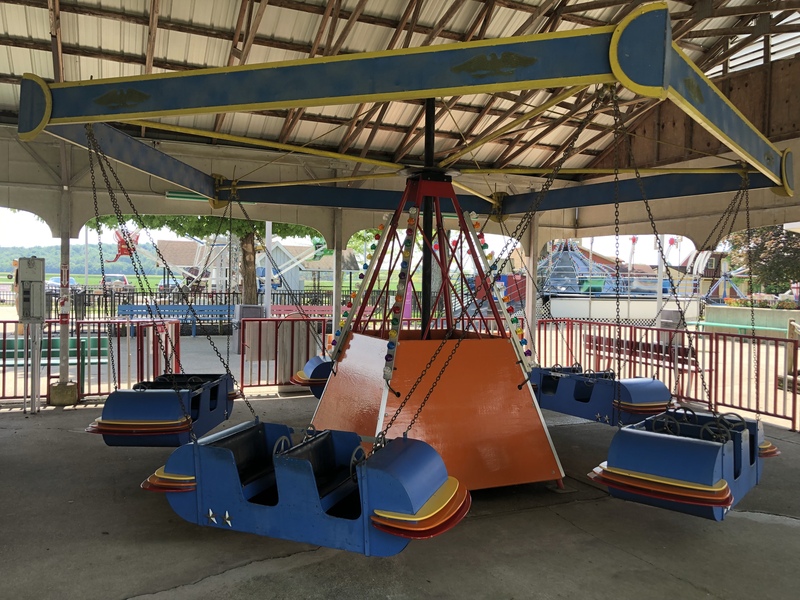 Those four gondolas spin around an axis point at the end of each arm and then the whole ride spins around the central axis point where all four arms are connected at the center. 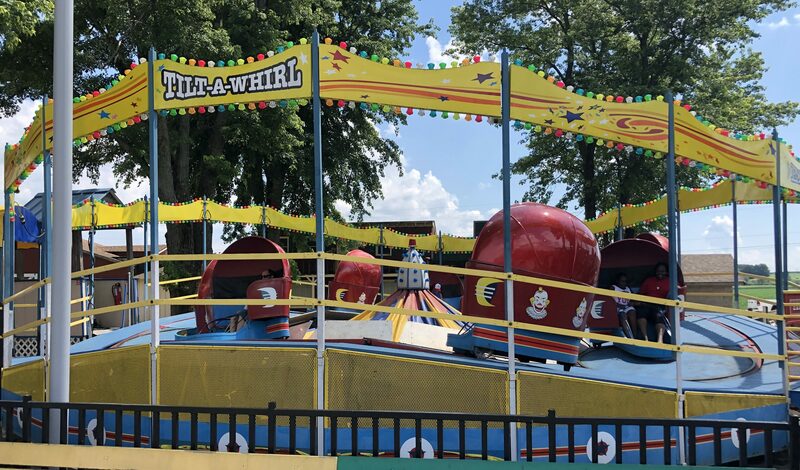 Next up is a classic attraction called the Tilt-A-Whirl which was originally built by the Sellner Co. and now manufactured by Larson Int. I absolutely love these attractions, especially the older ones with the big round cover over each gondola. This attraction is similar to the Waltzer attraction that operates all over Europe. There are seven free spinning gondolas that rotate around a central axis point along an undulating course. You can really get the gondola to spin if you lean or throw your weight in the right direction and at the right time. I can’t really explain how and when to do it so you’ll just have to watch and observe one in operation at the park. 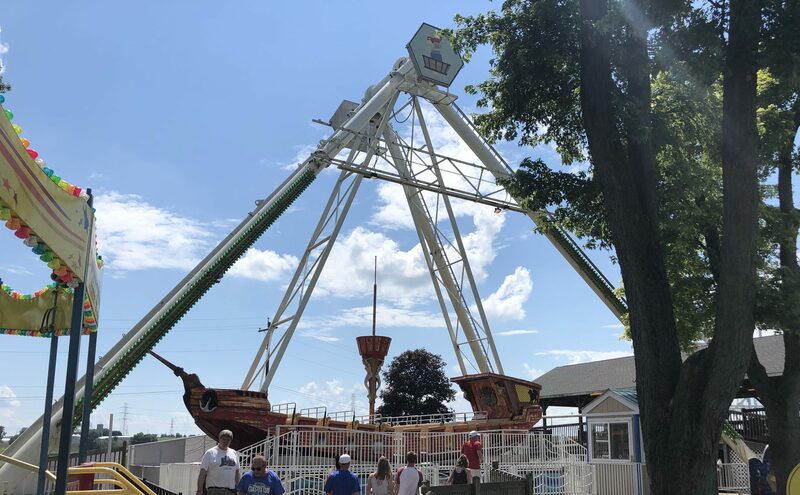 Next up is the Pirate Ship. This one was built by HUSS Mfg. and does not go upside down. 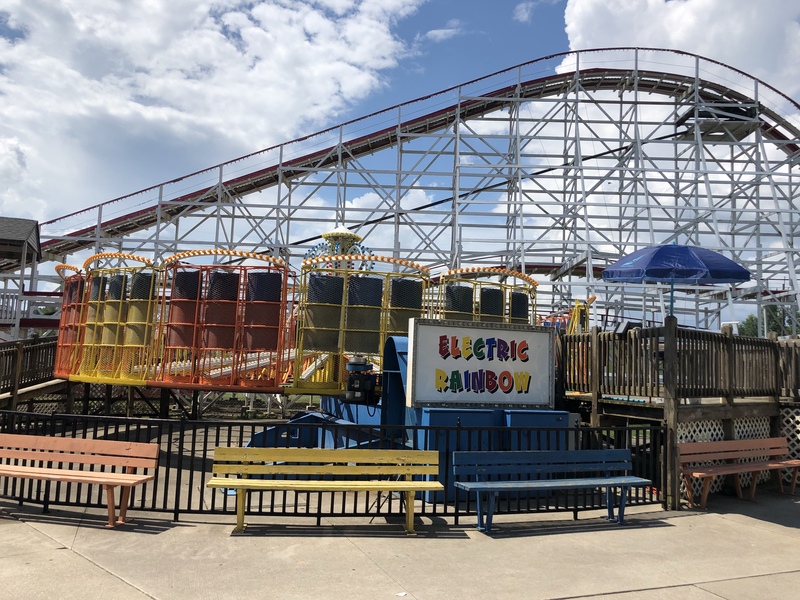 Next up is a ride called the Electric Rainbow. 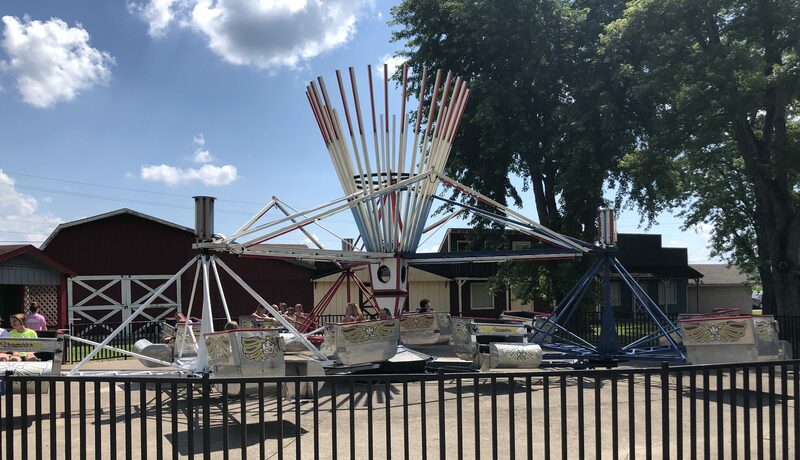 This ride is Round Up model from the Frank Hrubetz & Co, it actually operated at the former LeSourdsville Lake Amusement Park (aka Americana Amusement Park) in nearby Middletown, OH. 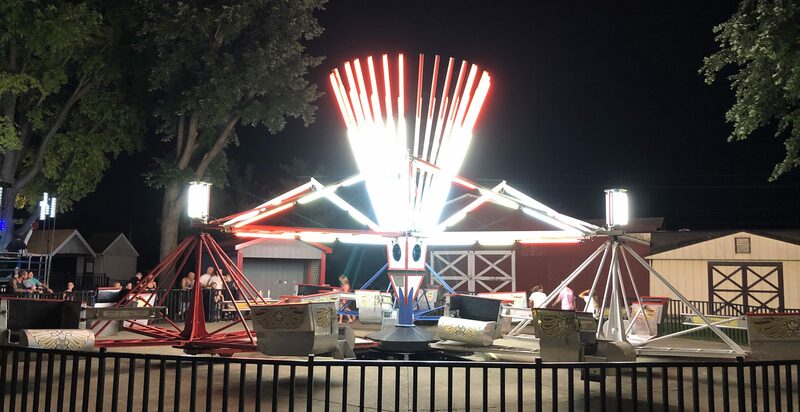 These rides are also known as the Meteor and Meteorite. 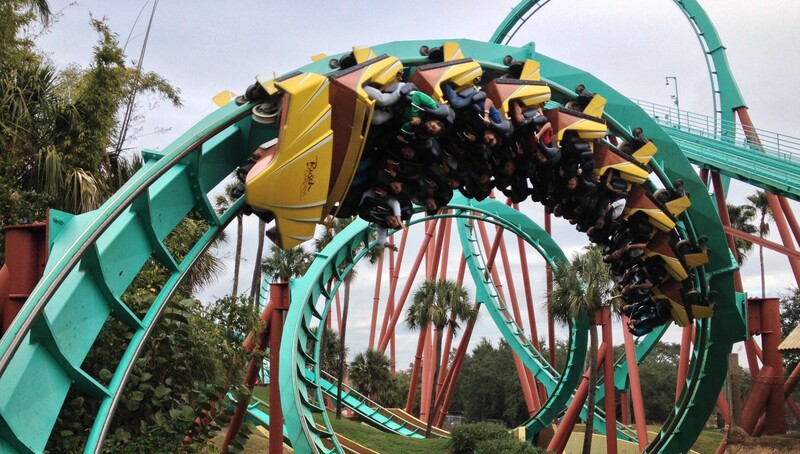 Riders are secured to the inside of the wall in a standing position when the ride is on the ground. 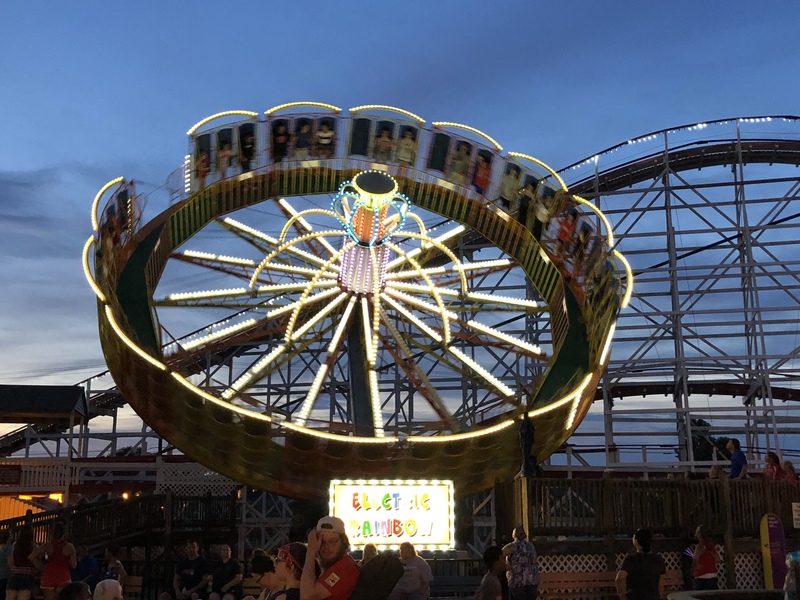 Then the ride rotates so fast that riders are literally pinned to the cushioned wall, and then the ride starts to elevate to the position in the photos. It stays there for a minute or two and then descends before coming to a gradual stop. I just love the way a park lights up at sunset and night, don’t you? 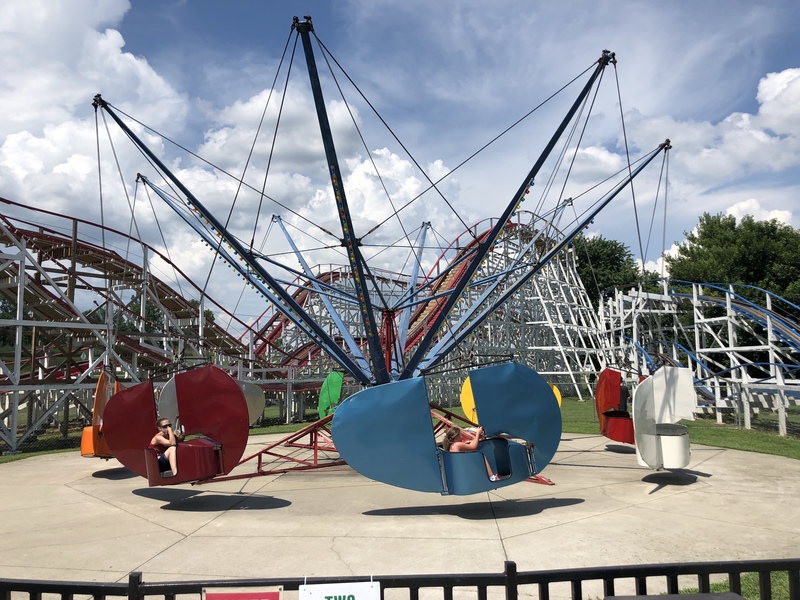 Up next is the Flying Scooters, a classic attraction from the Bisch Rocco Co. 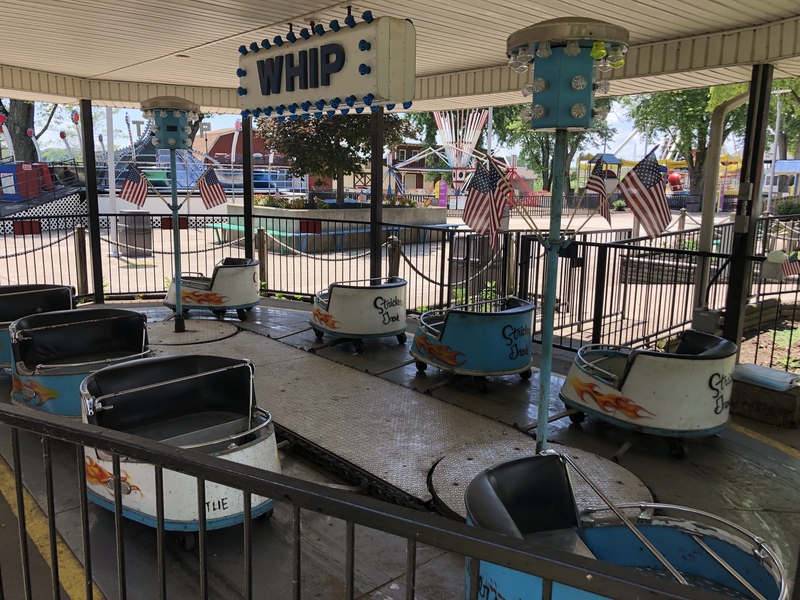 This attraction design is actually quite old and still being built and maintained by Bisch Rocco, the company that invented the attraction. 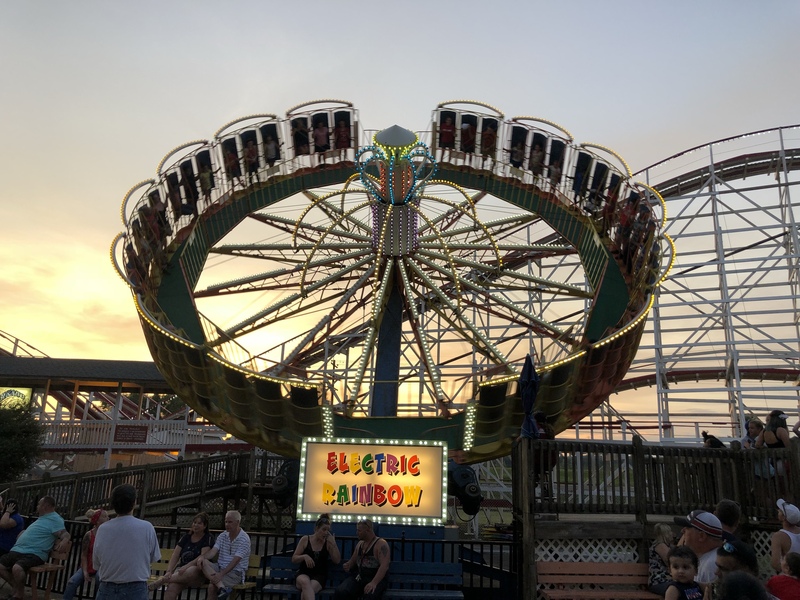 This one spins around a central axis and the rider can control how high they go by moving the giant rudder in front to the left or right. You can get pretty high if you know how to do it just right. 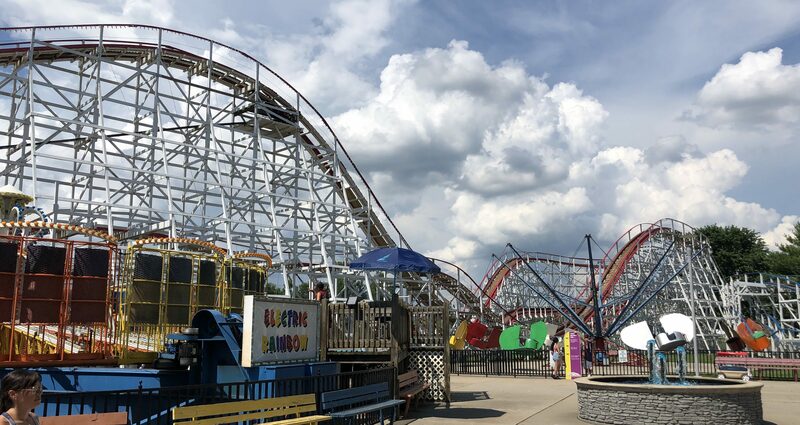 Now we come to the parks star attractions, the two classic wooden roller coasters. The first one is called The Teddy Bear. 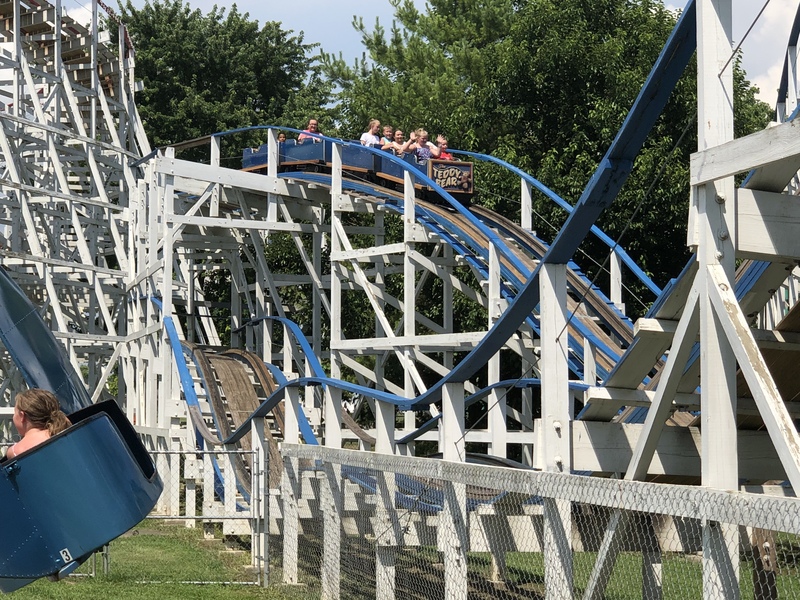 This coaster opened here in 1996 and was built by Ralph Stricker using the blueprints from the original 1935 Teddy Bear coaster that used to operate at Cincinnati’s Coney Island. 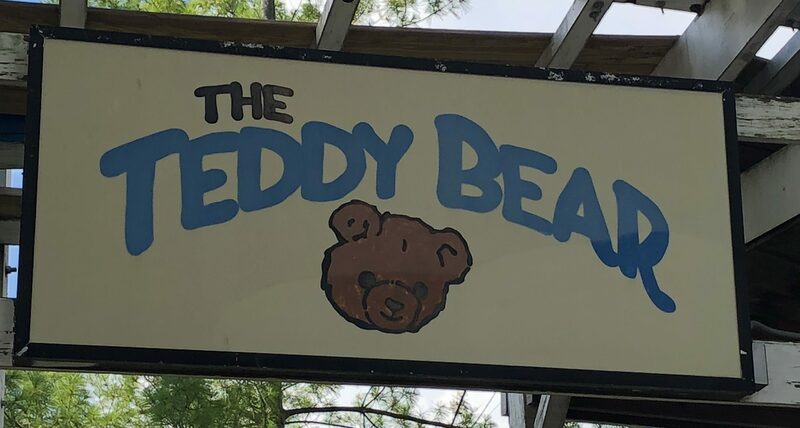 Here is my on ride video of the Teddy Bear. 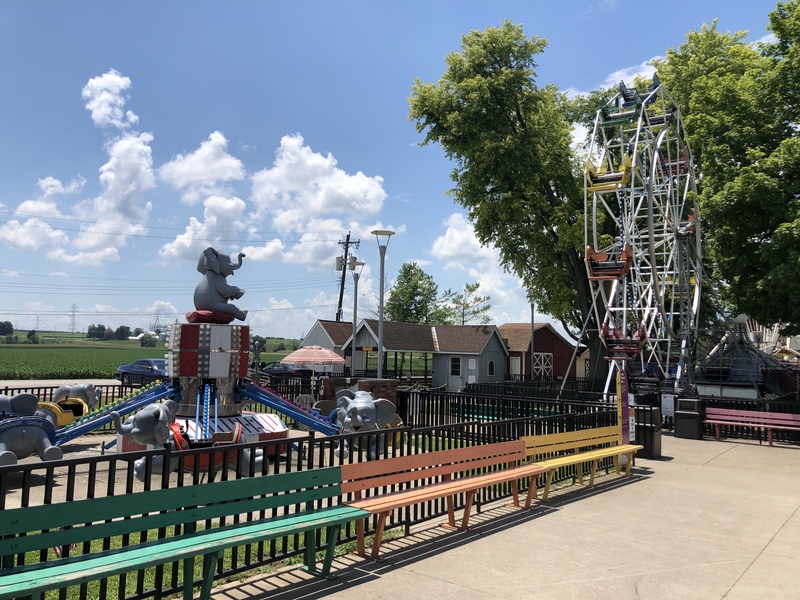 The last attraction is the best one and it is the Tornado which was built by Ralph Stricker and designed by Al Collins. 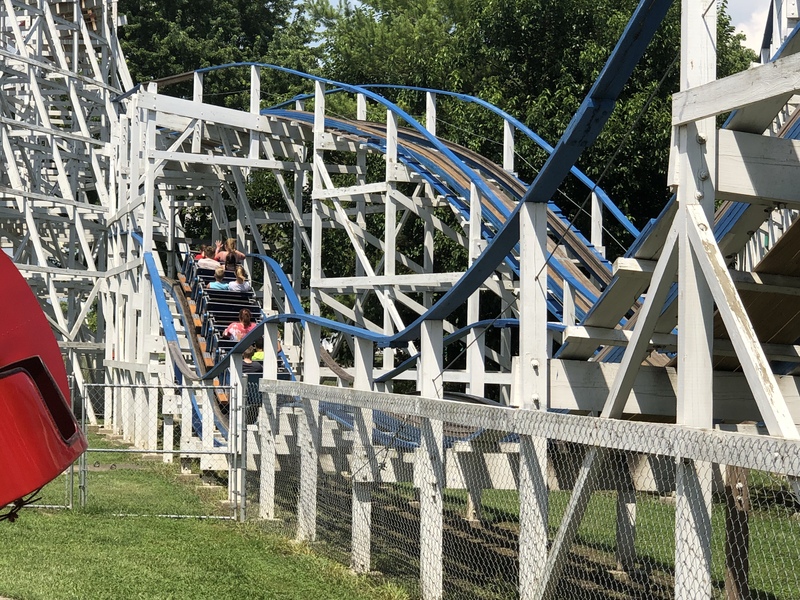 Construction started on this coaster in November of 1990 and finished in June of 1993 and is basically an exact copy of the former Comet/Mighty Lightnin that operated at Rocky Glenn Park in Moosic, PA. 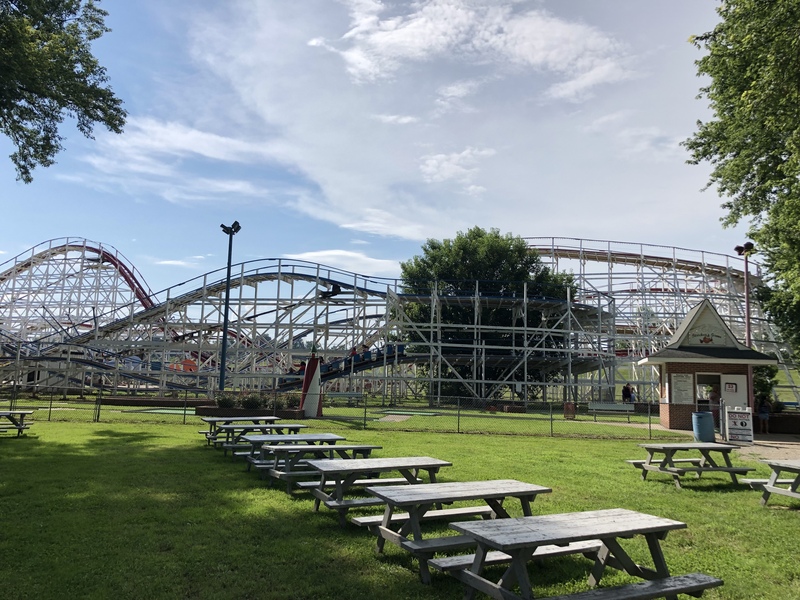 The park originally bought the coaster trains from the Tornado coaster that operated at the former Petticoat Junction/Wedgewood Village but were unusable as they had deteriorated badly at that point. 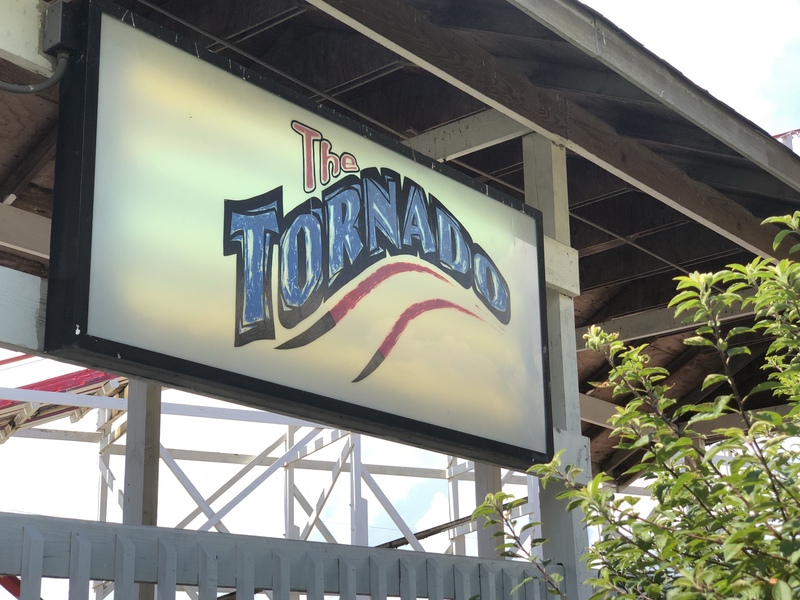 Here is my on ride video of the classic Tornado. Now we reach the end of this review and I hope you enjoyed it as I enjoyed writing it and sharing my views. I really enjoyed my time at the park and I highly recommend getting the ride all day wrist band. 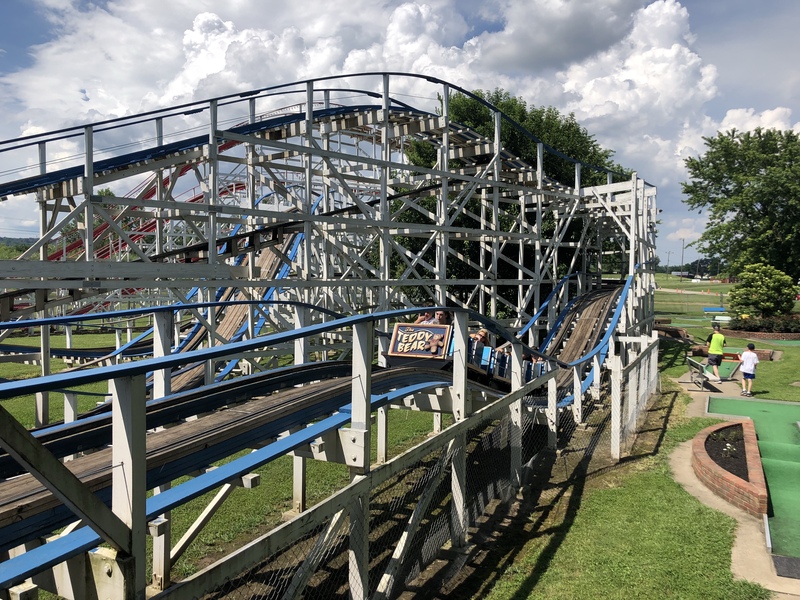 Usually, I recommend which row to ride in on the coasters but there really isn’t that much of a difference front to back on both coasters and I rode them multiple times and enjoyed each ride and I must say they are pretty smooth for wooden coasters. I recommend going to this park but, as I said before, you need to check their website to see the dates they’ll be open.